I love to prepare food in advance and freeze it. When your ready for a quick and easy dinner just thaw and cook. I used to do this once a month with a company called “Dream Dinners”. One day I realized I could just do it myself. This is a great way to spend time in the kitchen on a cozy day and premake meals to have all month. Go to the Groc store and get what you’ll need. Use good quality zip-top bags and fill with your ingredients. 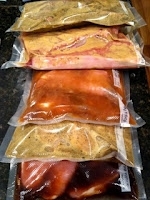 Good ideas: Your favorite uncooked meat in your favorite marinade in a zip-top bag. Do different bags with different meats and marinades.Put rice in another bag and biscuits or rolls in another and keep together, label and freeze. When ready to serve, thaw and grill and serve over the rice. Serve with a fresh veggie and the bread. Another idea is your favorite meat seasoned and placed in a bag. In the other bag put room temp butter mixed with chopped garlic and/or lemon, parsley, etc..(or butter mixed with gorgonzola cheese, butter mixed with crabmeat, etc…).Freeze them in separate bags but put together. When your ready to serve, grill the meat and top with flavored butter and serve with a salad. Casseroles freeze great. Just buy your ingredents and put everything together in advance freeze and enjoy all month. Put together as many as you can in one day. You can spend 2 hours one day and prepare for as many as twelve days…and it’s so much more fun. This entry was posted in Entrees, Misc by Modern Mom Meals. Bookmark the permalink. » How do you boil eggs?